Katakoi no Tsuki focuses on a group of four friends. Three of them — the athletic Souta, the serious and studious Chiaki, and the pretty Miyako — are childhood friends and have known each other for years. The fourth member of the group, Kurumi, joined them this year. She was recruited by Souta, who was excited when he met her and realized she is a great cook. Her lunches taste so good, he dragged her to the school roof where their small group meets every day, and they were all soon fast friends. Their small group is very friendly and affectionate, and they treat Kurumi almost like a pet, hugging her and thinking she is adorable. For her part, Kurumi loves being with Souta, Chiaki, and Miyao. She makes treats for them, and they have fun chatting or studying up on the roof. For Kurumi, the days are especially important to her because she has a huge crush on Souta. He is cute, outgoing, athletic, and very friendly. When they all went to an evening outdoor festival, he even protected her from a pervert. 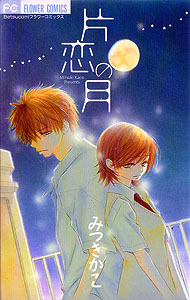 But Kurumi soon realizes something very upsetting to her – Souta is in love with Miyako. His behavior when he helps out Miyako when she is in danger is so much more intense and heartfelt than the fierce but friendly protection he offered Kurumi. Miyako seems oblivious of Souta’s deeper feelings, but now that Kurumi knows, she feels she must step aside. Miyako is her great friend, and she can’t steal Souta away. All she can do is be a good friend to them both. Souta and Kurumi are very close, but only as friends, of course. Because of this, they have lots of fun times, and Souta feels comfortable around her. Comfortable enough to eventually talk about his feelings for Miyako. Kurumi can only smile and be supportive. I like how this manga began and I suppose it was the right length for such an overdone plot, but part of me wishes the resolution didn’t feel so rushed. I felt it didn’t sustain the empathy the reader has for Kurumi in the beginning. The art was very lovely though and gave me a bittersweet feeling — all in all, it’s still a pretty good manga. ^_^ Thanks for sharing!